Pres. 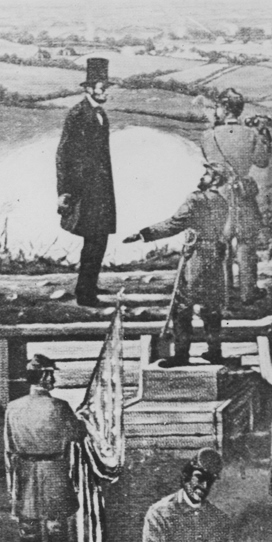 Abraham Lincoln at Fort Stevens, 12 July 1864 (public domain illustration). With the Union’s Red River Campaign across Louisiana finally over by June of 1864, their supplies replenished, their dead buried, and the traumatic injuries of their wounded on the mend by early July, it was time for the 47th Pennsylvania Volunteers to move on. Still part of the 2nd Brigade of Brigadier General William Dwight’s 1st Division in Brigadier General William H. Emory’s 19th U.S. Army Corps, Companies A, C, D, E, F, H, and I received orders on the 4th of July to leave Companies B, G and K behind and march for Algiers, Louisiana. Boarding the U.S. Steamer McClellan there on Thursday, 7 July 1864, the bulk of 47th Pennsylvanians then sailed away from the docks at 1 p.m. Note: Left behind in Morganza, Louisiana under the command of F Company Captain Henry S. Harte to await additional transportation, Companies B, G, and K sailed later that same month aboard the Blackstone, made a brief stop at Bermuda Hundred, arrived in the Washington, D.C. area on 28 July 1864, and reconnected with the remainder of the regiment and the 19th Corps three days later in Maryland at Monocacy. Carrying sealed orders with instructions that they be opened and read only after the McClellan had traveled “beyond the bar,” Companies A, C, D, E, F, H, and I sailed in the dark – figuratively and literally. “The passage down the Mississippi was mostly at night, so I am unable to give you a description of it. An expedition was on the move but what point no one outside of headquarters was able to tell. It was a secret move,” wrote C Company Musician Henry D. Wharton to his hometown newspaper. 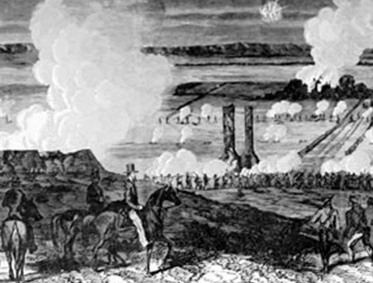 He and his superiors were among the many who speculated that the regiment was headed for new duties near Mobile, Alabama which would place them under the command of Major General William Tecumseh Sherman. Note: This speculation proved to be completely off the mark, and would result in the utterly incorrect “documentation” by numerous genealogists, historians and news reporters which persists even today that the 47th Pennsylvania had participated in Sherman’s March to the Sea and the burning of Atlanta when the 47th Pennsylvania Volunteers were nowhere near Sherman and his troops during those incidents. 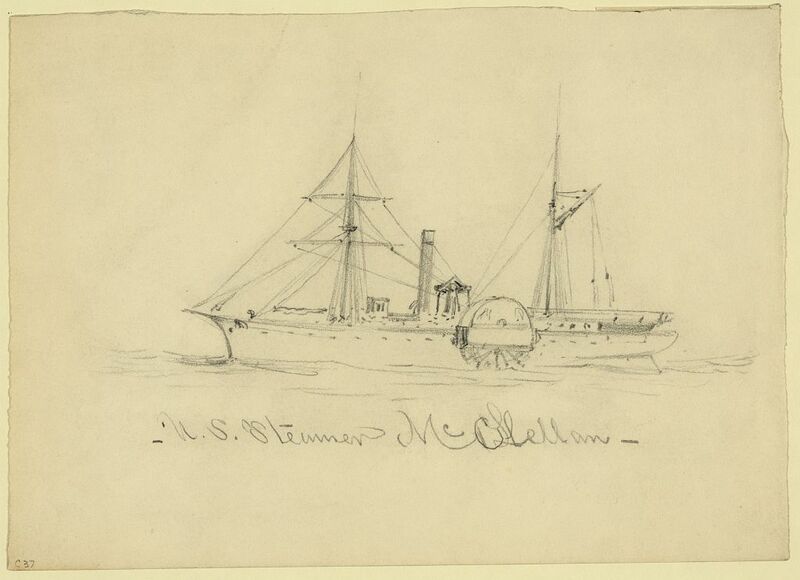 U.S. Steamer McClellan (Alfred Waud, c. 1860s, U.S. Library of Congress, public domain). His body was prepared for burial by nicely sewing it up in blankets, with weights attached to make it sink. The funeral was conducted by Chaplain Rodrock, who read the beautiful sea service from the prayer book of the Protestant Episcopal Church. The ‘Flag of our Union’ was at half mast, the boat stopped, and as the sun was hiding in the west, the body was launched into the sea, sinking to rise no more, until the great day comes when the soul must give an account for the ‘deeds’ done in the body. At 7 a.m. on Sunday, 10 July, the 47th Pennsylvanians began rounding the tip of Florida, sailing past Fort Jefferson in the Dry Tortugas, and on past Key West at 2 p.m. An intense yellow fever epidemic among the locals and remaining soldiers stationed there eliminated all hopes of a short sojourn at Fort Taylor. According to Captain Gobin, “Pleasant weather attended the voyage,” and the McClellan finally steamed into Hampton Roads, Virginia on the afternoon of 11 July. But before the ship’s anchor could even hit the water, the 47th Pennsylvania Volunteers were receiving new orders – directed to march for Washington, which they did the next morning. Little did they know they would soon have yet another memorable story to be passed down to their grandchildren – and their grandchildren’s grandchildren. Lincoln Arrives on Horseback at Fort Stevens, 12 July 1864 (Frank Leslie’s Illustrated Newspaper, 13 August 1864, public domain). We landed at the Navy Yard, were met by an officer with instructions to move out at once, leaving a detail to look after baggage and horses. Up the avenue and out Seventh St. we at once proceeded, and at intervals were met by handsomely uniformed officers, who urged us to hurry up double quick. Officers and men moving along discussed the cause of all this, but with no intimation of trouble or information or instructions of what was needed until we heard the sound of artillery and later of musketry. This was so startling, as it was repeated from file to file, that everybody made a rush to get near enough to see him. There was no mistaking him. His tall figure and high hat made him prominent, and I think every man of the regiment had a look at him. Our Corps badge resembled that of the 5th Corps, and to many inquiries, ‘Do you belong to the 5th Corps?’ the answer was, ‘No, to the 19th.’ Considerable curiosity was evinced to know where the 19th Corps was from, and great surprise was expressed as to how we had gotten there from New Orleans, as it was stated, just in time. In the meantime, numerous officers had been circulating around, various orders had been received, but nobody seemed to know what to do with us, and the regiment stood awaiting definite instructions. At last it came, to move out to the left and deploy, move forward and connect with Bidwell’s Brigade. As we came into line and moved out, a young staff officer rode down the line, shouting, ‘You are going into action under the eye of the President! He wants to see how you can fight.’ The answer was a shout and a rush. We met with but little opposition. A sparse picket line of dismounted cavalry got out of the way readily, other regiments came in on our left. We did not meet Bidwell’s Brigade, but passed over their battle ground, until, after nightfall, we passed over some of the ground they had fought over, and recognized the red cross of the 1st Division, 6th Corps, as being the fighters. They had evidently been on the extreme left of the line in action. We bivouacked that night near the remains of a burnt house which was said to be Montgomery Blair’s. The fighting was virtually over before we arrived, but the camp was full of stories during the night as to what had occurred at Fort Stevens while the President was there. Evidently that fort was within the range of the artillery and the skirmishers of the Rebel Army, and it was rumored that General H. G. Wright had positively ordered the President to get out of the range of danger after an officer had been shot by his side. ‘And you would do quite right, my boy,’ said the President, coming down at once, ‘you are in command of this fort. I should be the last man to set an example of disobedience.’ He was shown to a place where the view was less extended, but where there was almost no exposure. As Mr. Chittenden was present and speaks from personal knowledge, I assume this to be a correct statement. I have recently seen a publication in which an officer, claiming to be on the staff of General Upton, describes the President as having halted at the side of the road, and with having been struck by a stray bullet. No mention of it is made in any of the accounts hitherto published of his presence. Certain it is, he was in the Fort and not in the road when we reached there. There were no other troops except those in the trenches and in the Fort at that time, and my recollection is that it must have been after dinner, the fight well over as, although we went in immediately and rapidly, we had no serious casualties. Our Brig.-General came to us, as he said, as soon as he could get a horse, and halted us for the night. The 47th Pennsylvanians could breathe a sigh of genuine relief when they were all finally reunited in late July of 1864. President Abraham Lincoln was still safe – and the boys from Companies A, C, D, E, F, H, and I had gotten a very good look at him. 1. Gobin, Companion J. P. S. Lincoln Under Fire, in records of the Memorial Meeting held on 13 February 1907, in Abraham Lincoln. Philadelphia, Pennsylvania: Commandery of the State of Pennsylvania, Military Order of the Loyal Legion of the United States, 1907-1911. 2. Schmidt, Lewis. A Civil War History of the 47th Regiment of Pennsylvania Veteran Volunteers. Allentown Pennsylvania: Self-published, 1986. 3. Wharton, Henry D. Letters from the Sunbury Guards. Sunbury, Pennsylvania: Sunbury American, 1864. This entry was posted in 1864, Abraham Lincoln, American History, Civil War, D.C., Memorial Day, Military, Pennsylvania and tagged 47th Pennsylvania Volunteers, Abraham Lincoln, America, American History, Army, Civil War, D.C., Fort Stevens, History, Pennsylvania, Sunbury, Union, Washington.